Inside the cabin, the decision was made early on that we would panel the walls. It was obvious that the logs used, although they were rustically attractive, were not really suitable for being left bare. As good as our construction technique was, there were still spots where hairline gaps remained that allowed our precious heat to escape, as well as the fact that they were rough and not even enough for most purposes. By making the decision to panel the inside walls, we were also immediately opening up the opportunity to add a bit of insulation. Something I began already last winter, but it's been a slow process, and I must confess that really only the bathroom can claim to have the insulation and outside wall paneling completed. Interior walls are for the more part fully paneled, to ensure privacy. Exterior walls though only have the insulation installed. At least, all but the "east" side. 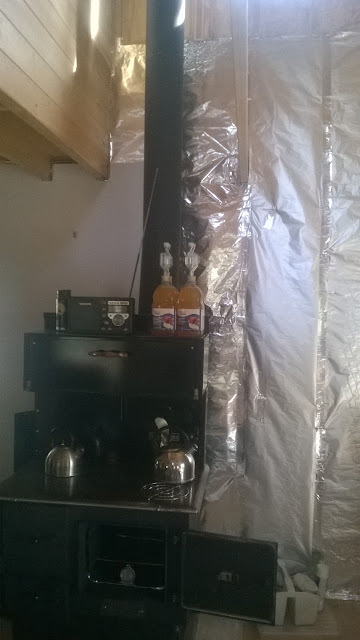 During the construction phase, I hadn't planned for the possibility of panelling or insulation, so when we installed the cookstove, I opted to use the minimal clearance between the stovepipe and the wall, plus an inch just for a margin of error. 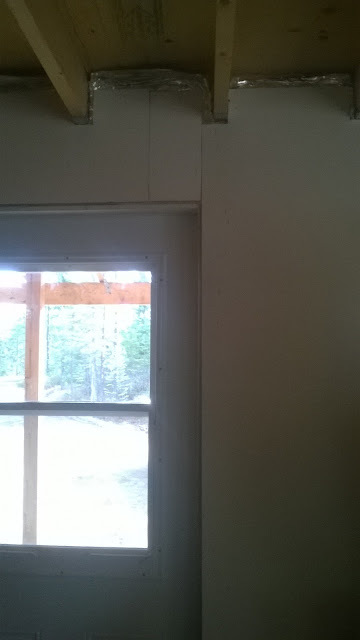 As such, an inch isn't enough space to add the panelling as well as a half inch of insulation. Instead, I've opted to cover that wall entirely in aluminum foil (thank you Dollarama!) with the joints taped with foil tape. Working around the fiddly sink and wires. Over top of that, I have added 1/8" white panel board to help "smooth" out the waves and imperfections in the wall. And whiteboard halfway behind the stove. Still working on it! My plan now is to add on top of that some 11/16" v-joint panelling, and that will take up up to 15/16" of my allowable inch. Perfection! 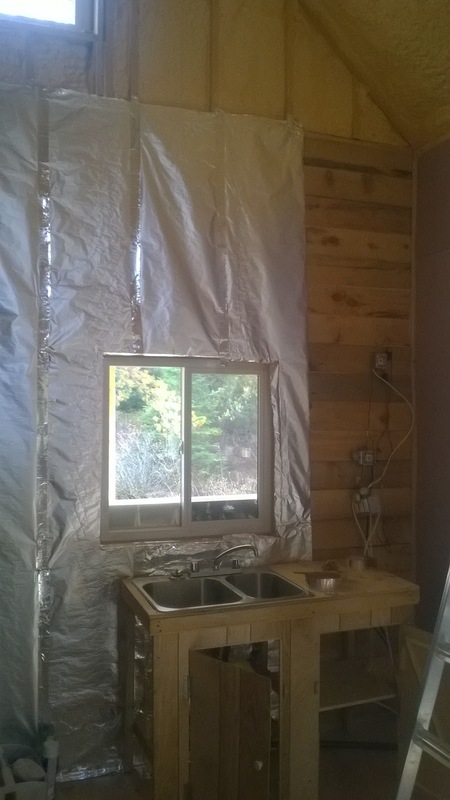 I still have a bit more panel board to do in the kitchen, but the tricky bits around the sink and electrical wiring have been completed, so hopefully it shouldn't take too long to get past that phase. The other driver for this particular portion of the project is the new water system - I plan on putting in the water tank above the kitchen sink, and I don't want to install it until I have the wall behind it complete. The tank is being modified at the moment, so I have a bit of time to work on this before diving into a major overhaul of our plumbing. Unlike the current water line from the sauna to the original well, I have opted for the new water line from the cabin to the new well to be hidden and buried. 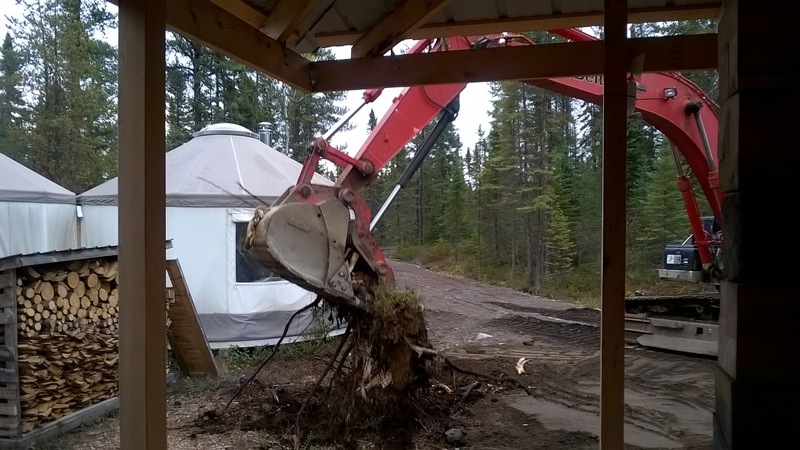 To facilitate this, I had the excavator carve out a shallow trench from the side of the well, all the way to the corner of the cabin where our greywater line had exited into the greywater pit. With a surprisingly blessed sunny, almost warm day here, Grandpa, Kenny and I all grabbed our shovels and proceeded to take a huge chunk out of the leftover sand pile. First we organized the electrical cables that needed to also be included in this operation. I have decided to run a new cable into the cabin for charging the batteries from the generator - the existing one that ran over to the far side of the sauna was undersized really - and additionally to that, I could see a spot where the cord had rested against a hot part of the generator for some time and become partially melted. Not something I wanted to rely on for the winter. Also, it was just an inconvenient location for the generator to have to slog through the drifts of snow to reach it on the far side of the sauna. Now I can move the generator around better and have a choice as to where I would like to place it, which can change depending on the needs and circumstances that may arise. I also opted to run a line out to the deck to have an outdoor outlet there. Occasionally I have run a cable through the window - but that's a less than elegant solution. I think it will be useful to have access to A/C power from outdoors without having to go through a door or window. Then there was a line to power the pump in the well, and another line to power the heating cable in the well. Four in total - plus the water line itself. We had snaked the water line, pump wire and heating wire through a number of lengths of stiffer pipe to help protect and support it, and now we carefully pulled them into a long arc and began feeding the four cables and water line through the hole in the footing of the cabin and underneath. I went down into the crawlspace while Grandpa fed the lines from outside. It was a rather simple matter to pull them in and then head back outside. With my level and a number of pieces of scrap wood, we ensured a good, consistent slope from the corner of the cabin down to the well. Then we all pitched in piling sand underneath the line. Once it was supported, we continued with our work until we had a good mound of sand over the entire length of the line. Looking good from the cabin! 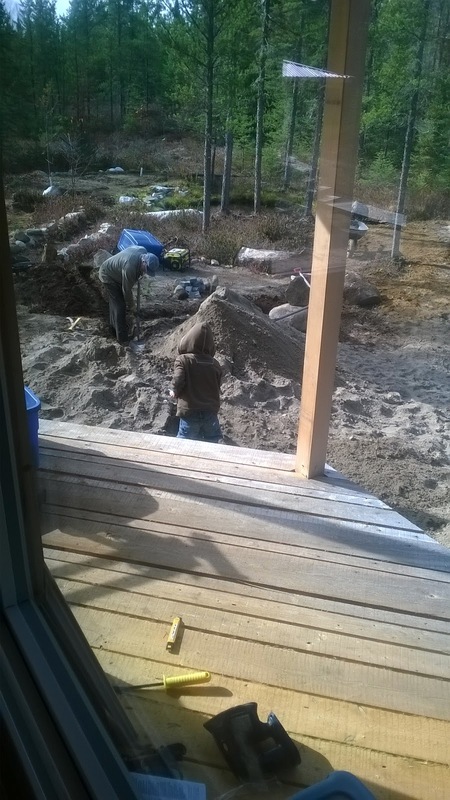 Grandpa then switched priorities to digging a trench from the greywater pit closer to the pond. Donna and he had observed a few days ago that when she was doing laundry, the ground over the pit had gotten very wet - it appeared that perhaps the extreme compaction caused by the excavator driving over the pit area was causing the greywater to stop draining, or to drain rather poorly. 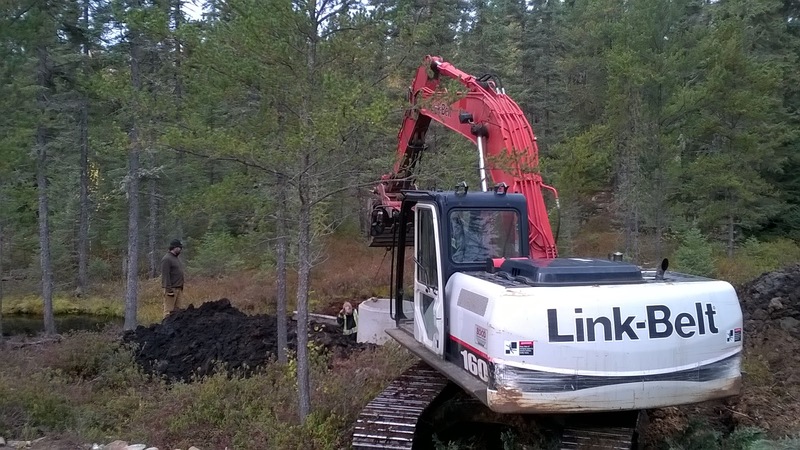 In spite of a long trench and a concerted effort with Kenny, Grandpa was unable to locate the original greywater pit. He decided he would take up this cause again later in the week, but for now, I'm very pleased with all the work that we accomplished! Raiders of the Lost Greywater Pit. While I've never had to do it to a vehicle, I suppose it should be theoretically important to check the water levels of the batteries (assuming that they are standard Lead-Acid) on occasion. Incidentally, last winter when the Echo refused to start on a cold day early in the season, I made the executive decision to swap out the battery for a more expensive, but hopefully better performing glass mat battery - one that should be much better able to handle extreme low temperatures, as well as not requiring water. In any case, for our cabin, we are utilitizing the very old, very proven technology of FLA batteries, or "Flooded Lead Acid" - batteries that are essentially made up of thick plates of lead, submerged in sulphuric acid. This has the overall effect of causing the acid levels in the batteries to be reduced and concentrated. There's nought to be done for it really, aside from purchasing much more expensive sealed batteries. Instead, one just has to do a routine maintenance chore of topping up the water levels from time to time with distilled water. The new bottle really helps! But the floor makes an even bigger difference to this chore! I used to try to do this with a turkey baster, but over the summer found a purpose-built bottle for filling batteries at the local ToolTown store. This has helped greatly with the adding of water, which I try to do every month or two. I've not found it to be a hardship at all, although in winter it was less palatable than it is now. This year should be even easier now that I actually have a deck to stand on when I do this, rather than slogging through the snow to perch on the floor joists. As I surely don't need to remind anyone who's been following our blog, water issues have been following us since the very beginning. 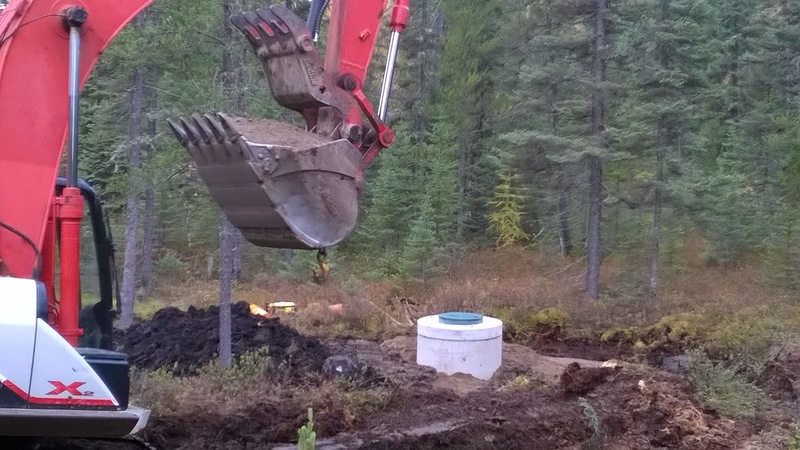 Our first well was installed quite a noticeable distance from the cabin - namely on the far side of the sauna, about 200' from the cabin, with the sauna housing our reservoir tanks. 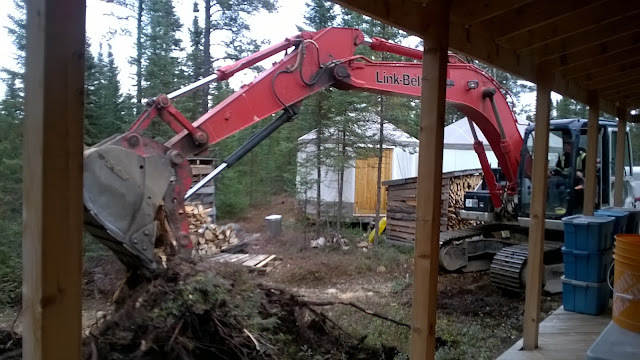 Normally we have been pumping the sauna tanks full, and then they go on to feed another underground line to the cabin. This works not too badly in the summer time when the water doesn't freeze up, but come winter, it has not been possible to keep the water line thawed between the sauna and the cabin, where water sits without moving for hours at a time, and it rests only two to three feet below the surface, on bedrock. Another issue with that well is that because of its location, it was difficult to pack much sand around it, and as such, it perhaps doesn't have the best of natural filtration. We have not yet been able to fulfill the basic test requirements to drink the water from it without filtering or treatment. So it was after this past winter with us schlepping buckets from the sauna to the cabin for drinking, doing dishes and laundry, I decided we had to take a new tack. 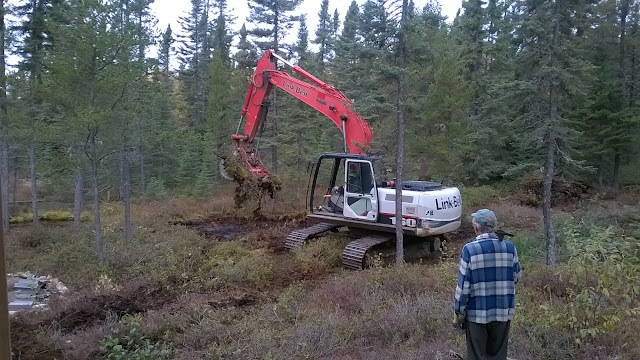 Knowing that the pond had been dug out to a depth of six feet, I was certain that that area had definite possibilities for finding a suitable spot to put in another well, which was much closer to the cabin. I wandered to some low areas, and noticed that all summer long there were locations with open water in amongst the trees there. I called up B.J. Kapush, the fellow who had originally dug the well and beefed up our driveway, and asked him to come out for another crack at a well in that location. He arrived shortly afterwards and agreed that there was a decent chance for us to get something useful in there. Just for confirmation, he plucked a nearby willow branch and witched the area. As he crossed open water, the branch clearly dropped straight down. I'll leave my readers to satisfy their own opinions of the value of witching water. In Lappe, I think it's taken rather seriously. I'm happy to have my own biases confirmed in any manner. 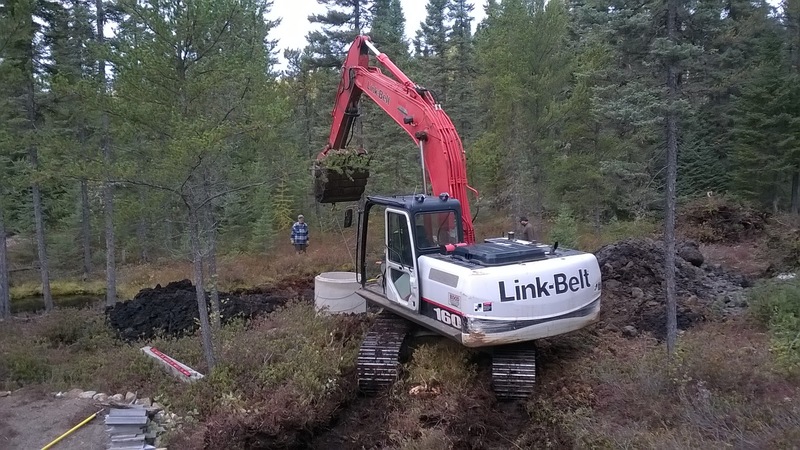 After finishing up another big job he had been working on, he arrived with his large excavator, two well tiles, and a culvert to help with drainage on the front driveway. Who doesn't love these big machines? First up, he expanded the parking area directly in front of the cabin. This was something I hadn't really discussed or thought of, but could immediately see the value of. Now we can park two or three vehicles at the cabin without crowding - very nice! In seconds he can accomplish what would take me days. After that, he quickly came around to the north side of the cabin and tore out some unsightly stumps that I had previously been zig zagging around with the ATV. This should also improve drainage on that side. With these preliminaries out of the way, it was time for the main event. He came around on the south side of the cabin and quickly lifted off the huge stump of the tree I had cut that was right where I most expected success. You can imagine my delight when a pond appeared beneath it almost immediately. 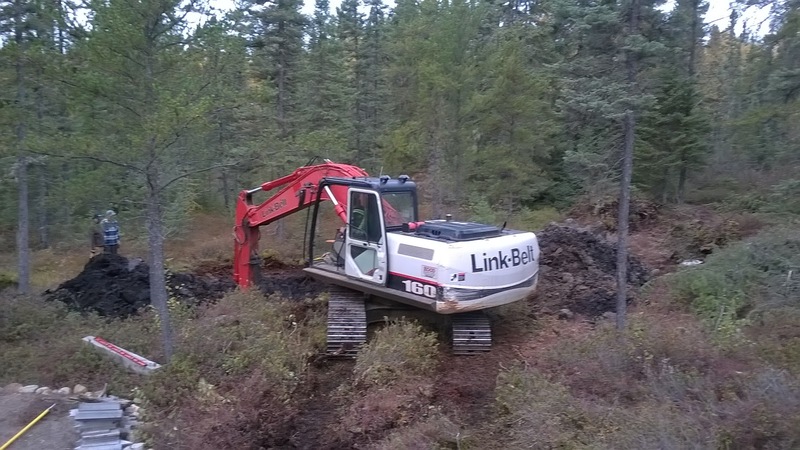 He lifted out more and more soil in the area until he finally hit bedrock, I'd estimate at between six and seven feet of depth. Water was running (I almost said gushing - but I don't want to oversell my excitement) in all around and he worked quickly here. Scraping the bedrock cleaner than I would have thought possible with such a large implement, he brought down the first tile and set it into place. Quickly he added nice, clean sand all around and then with the help of his assistant and a level, tapped it until she declared it to be "perfect". Racing back with a second tile, he placed this and packed more and more sand around. Once the sand was up most of the way along the sides of the second tile, he again had his assistant check for level and made some fine adjustments to get it too to rate "perfect". Tile number two being carefully adjusted! Pumping it out and then scraping out a few buckets of the muck in the bottom, we were really feeling good about the way things had been turning out. He added the lid and then proceeded to fill in and slope the sand around the well. 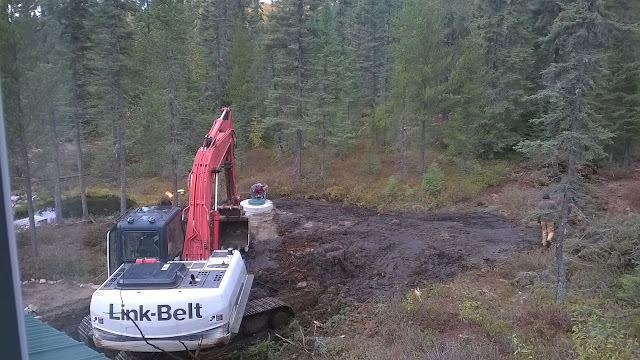 As requested, he also scraped a shallow trench from the well to the corner of the cabin where the water line would be entering through the foundation in the same spot that the greywater system drained out. Working backwards, he landscaped his way back to the driveway, where he also proceeded to give me a "push out" about halfway down the front drive - a spot where I could push snow in the winter time to relieve the banks hopefully. He also added a culvert and built up the area where the driveway had settled the most and was beginning to flood in the spring and after heavy rains. 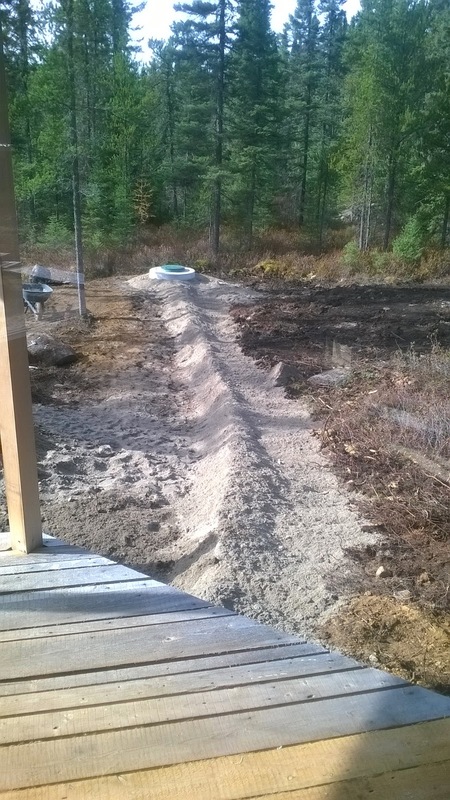 As a final help, he graded the area where the dojo tent formerly stood before I moved it on, and left a pile of gravel there for me to use as I saw fit whenever I needed to fill in any areas. 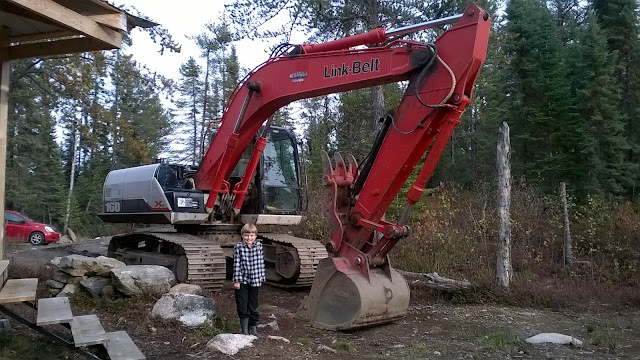 I am thinking of using it to really improve the bush trail, although Grandpa seems to already have his own thoughts about where it really belongs. As soon as they left, I headed back to the city to visit Maier Hardware and pick up a new pump, piping and pick Dave's huge brain for more confirmation that I'm on the correct track, or to see if he has any unique insights about better ways to solve some of my conundrums. While I was gone, Donna started the sauna and supper, so when I arrived it was a great chance to wash up and then enjoy a delicious meal and the company of my loving family.